Plum trees do not require as precise pruning as apples and pears, but still benefit from initial training and the thinning of old wood to ensure they produce as much fruit as possible. After the initial development years, plum trees don't require that much pruning. The purpose of pruning and training a plum tree is to encourage tree health and increase fruit yield. When plum trees are not carefully pruned, they can easily become heavy and break under their fruit load. 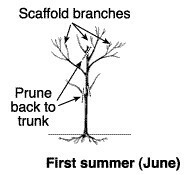 You'll want to prune plum trees in late winter before new leaves begin to emerge. This is typically February, but adjust this time based on your local weather. At this time it will be easier to detect buds that have been damaged by cold weather. If a flower bud looks as though it has been winter-killed, cut it off. Also cut off winter-killed limbs that have wrinkled bark. In some areas, gardeners prune plum trees in June to avoid certain diseases. To avoid risk of silver leaf disease, avoid pruning in damp weather. Small Bare Root Liners: These are single-trunk "whips" that usually have no side branches and should be topped at 24-30 inches above ground at planting time. How high you make this cut will depend on whether or not you'll need to be mowing or doing maintance underneath the lower branches. The shoots that will become the main scaffold branches of your tree will usually emerge on the trunk within 4 to 6 inches below where you make the cut. If the bare root tree is branched when it comes from the nursery, select 4 or 5 lateral branches growing with wide-angle crotches (greater than 45°) spaced evenly up and around the trunk. These will be your permanent main scaffold limbs. The lowest limb should be about 15 inches above the ground and the highest about 30 inches from the ground. If no desirable lateral branches are available, top the tree to 30 inches in height and cut out all side branches to a point where there is only one bud left on the branch. A shoot will often develop from these buds and may be suitable for main scaffold limbs. Many container grown trees purchased at your local nursery are 2-year old trees. If they were pruned properly by the grower these older trees will already have strong branches with wide crotch angles. During the first dormant season (winter), these branches should be pruned back (headed) to a point that leaves 6 or 7 buds on the branch. The height at which branched trees are headed depends on the size of the tree and the positions of good side branches. Remember, you will only be keeping 4 to 5 main scaffold branches. It's best if these are spaced evenly around the trunk. Remove any weak branches growing from the trunk and any suckers growing from the base.